The Ottawa Hospital Research Institute has one of the strongest neuroscience and stroke research programs in the country, thanks to outstanding basic and clinical scientists, and its close relationships with the University of Ottawa and other associated organizations that are working to improve our knowledge and treatment of stroke, such as the Heart and Stroke Foundation Canadian Partnership for Stroke Recovery. The Ottawa Stroke Program at The Ottawa Hospital is bolstered by the collaborative working relationships among more than 100 researchers associated with the University of Ottawa Brain and Mind Research Institute. The Ottawa Stroke Program is one of the strongest and most effective stroke research and care centres in Canada and internationally. Ottawa stroke care clinicians have achieved some of the shortest �door-to-needle-times� in providing therapy for stroke patients, and have been recognized by Accreditation Canada as a premier program in stroke care. In addition, Ottawa was home to the Canadian Stroke Network, a national collaboration that changed the delivery of stroke care around the world and after which the European Stroke Network modelled itself. A stroke occurs when the blood supply to part of the brain is interrupted, either by a blood clot or burst artery. Without oxygen, the brain rapidly loses the ability to function and irreversible damage can occur in just minutes. A stroke will also occur if a small artery feeding a small region of the brain gets blocked by inflammation. Our researchers are exploring a number of avenues to improve how we care for stroke patients. Standard clot-busting drugs can lessen the damage in many types of stroke, but they are only effective if given to the patient within a few hours of an attack. Clinician-scientists at the Ottawa Hospital Research Institute are conducting research to improve acute stroke treatment. For example, they are testing alternative clot-busting drugs and new neuro-interventional procedures. If these prove to be as effective as the current standard of care, thousands of patients with stroke could benefit. While clot-busting drugs can lessen stroke damage by restoring blood flow to the brain, many scientists believe that the next generation of therapies will be able to prevent the death of brain cells. Our researchers are leading an intense effort to determine which molecular mechanisms control brain cell death, because understanding this process is the first step in developing these next-generation treatments. While some researchers are studying death of neurons in the grey matter of the brain, others are investigating damage to nerve fibres that connect different parts of the brain (white matter). Another research project focuses on a phenomenon known as preconditioning, which can make the brain more able to resist a later stroke. The aim of this research is to identify genes in the brain that are turned on or off by the preconditioning process. Several potential treatments have been identified, and further research may lead to neuroprotective drugs that mimic the effects of these pre-conditioning genes. Another exciting area of stroke research involves finding ways to stimulate the regeneration of brain tissue. Very recently, it was considered dogma that once a brain cell died, it could never be replaced, but in the last few years, mounting evidence has shown that stem cells do exist in the adult brain, and they can be coaxed into generating new brain cells. Our researchers are exploring the molecular switches that increase the number of stem cells in the brain. While it will likely take many years to fully develop and test these regenerative treatments, stroke patients today can regain many of their abilities through rehabilitation programs. Our investigators based at The Ottawa Hospital Rehabilitation Centre are developing and testing new recovery interventions for patients with stroke. They are also investigating nutritional management and driving programs to improve health and quality of life of patients recovering from stroke. Intracerebral hemorrhage, also known as bleeding stroke, is the most severe form of stroke and affects more than 5,000 Canadians each year. The Ottawa Stroke Program has prioritized intracerebral hemorrhage research, and is part of an international effort seeking to better understand this disease and develop effective treatments. Diagnosing a stroke and anticipating when one is likely to occur are crucial to the successful treatment of stroke and recovery of stroke survivors. Our researchers are actively engaged in studies that use new brain imaging techniques to identify patients who are at high risk for strokes or whose brains are still bleeding. Finally, a big part of stroke research will always be prevention. 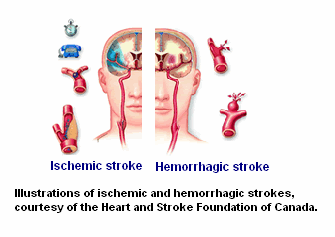 It is estimated that control of the known stroke risk factors would avoid 50% of the strokes suffered. These include high blood pressure, high cholesterol, smoking, diabetes and heart disease. The Ottawa Hospital now has an active stroke prevention clinic to ensure that the risk factors are controlled, because once a patient has suffered a stroke, the chance of having another substantially increases. Clinical investigators at the OHRI are involved in a number of clinical trials, and their research is contributing to better stroke prevention in Ottawa and around the world. Stroke research at the Ottawa Hospital Research Institute is supported by The Ottawa Hospital Foundation, Heart and Stroke Foundation Canadian Partnership for Stroke Recovery, Heart and Stroke Foundation of Ontario, Canadian Institutes of Health Research, the Ontario Ministry of Research and Innovation, and many other agencies. The HSF Canadian Partnership for Stroke Recovery is a joint initiative of the Heart and Stroke Foundation and Canada�s leading stroke recovery research centres � Sunnybrook, Baycrest, Toronto Rehab, University of Ottawa, Ottawa Hospital Research Institute and Memorial University.